Passion and excitement overflowed Wednesday morning at GCU Arena as hundreds of educators, specialists and students from across the state gathered with one purpose: to better education. “There is such an extreme power in teaching every single day and as teachers in the education profession we need to realize that power and take it up a notch. 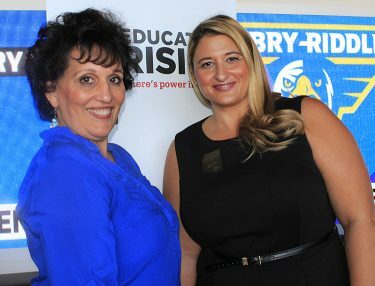 Teach up,” said Dr. Lisa Mayberry, GCU alum and state advisor for Educators Rising Arizona. 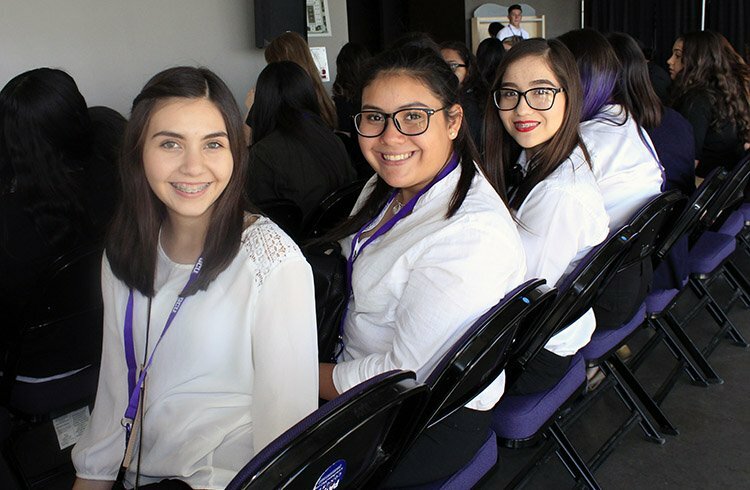 The passion of the students at the Educators Rising Arizona Fall Leadership Conference at Grand Canyon University was inevitable. Layza Ramirez (center) was one of several attendees who rode a bus five hours to participate. 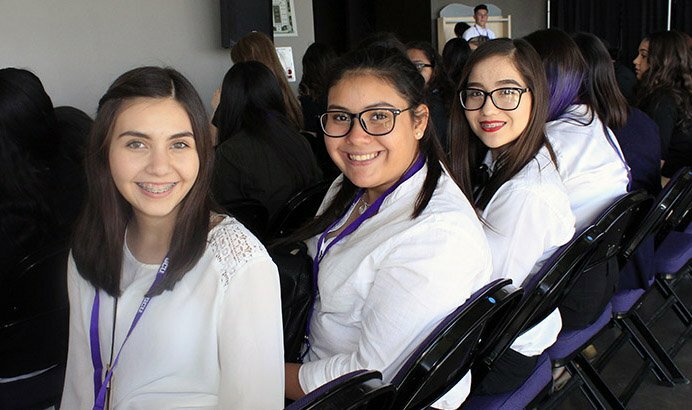 With a wide, beaming smile, Layza Ramirez explained why she and a few of her classmates took a five-hour bus ride to get to Grand Canyon University on Wednesday morning. That kind of passion and commitment was inevitable at the Educators Rising Arizona Fall Leadership Conference, where more than 560 education majors, faculty, specialists and students from across the state focused on one major point: becoming accomplished teachers. GCU faculty members Lindy Gaudiano (left) and Stacy Rucker reminded students why it is important to stay motivated and ask for help when needed. Ramirez talked of how excited she was about taking an early childhood education elective as a sophomore, where she was in constant care of a simulated baby, whether at school or at home. Like a real baby, the simulated baby cried when hungry, in need of burping or a diaper change. Educators Rising Arizona is a career and technical student organization dedicated to ensuring that the future is full of high quality educators starting in high school. EdRising provides students with the opportunities to take what they learn in their classes about early childhood education and the education profession and apply them in relevant, scenario-based competitions at the annual state leadership conference. GCU President Brian Mueller opened the conference by telling the story of working 80 hours a week in high school to save money to go to college and pursue his teaching dream. It was that initial determination that led him where he is today, and he said it became the biggest blessing of his life. “I graduated when I was 17 years old, but I come from a family of eight and I didn’t have the money to go to college,” he said. “Though it was the toughest time of my life, it was the best thing I could have ever done. I could have gone a less expensive way, but I wanted to have the total campus experience. I made enough to pay for my first three years of school in doing that. You can do it – do not limit yourself. Next up was Lennon Audrain, a junior at Arizona State University who teaches Spanish at St. Gregory Catholic School in Phoenix and serves as the National Student President of Educators Rising. Five months before he graduated from high school, Lennon graduated from Rio Salado College with an Associate in Arts degree in Elementary Education. Marjaneh Gilpatrick (left), Executive Director of Educational Outreach for GCU’s College of Education, and Dr. Lisa Mayberry, State Advisor for Educators Rising Arizona. In his keynote, Audrain first challenged students to think about teachers who had impacted their lives and referenced three teachers who had led him to his teaching journey. In their presentation, Lindy Gaudiano and Stacy Rucker shared ways for future teachers to develop lifelong motivation in themselves and their future students. EdRising provides students with the skills to teach effectively and efficiently. Finally, Rucker told the students to turn to their peers for support. “You are the ones that are finishing up assignments. You are the ones that are studying for a test. You are the ones that are preparing to be successful in the classroom. Use each other,” she said. In the College of Education, Jennifer Fowler, a teacher in the Glendale Union High School District, lectured on developing a growth mindset for success. Students also took a quick assessment of their mindsets. “It’s really important to know where students are in their thinking to help them grow and improve as learners to impact instruction,” she said. Dr. Lisa Mayberry, State Advisor for Educators Rising Arizona, a GCU alumna and an adjunct faculty member, has experienced the growth of Educators Rising firsthand. “I am very passionate about teaching, and I don’t think there’s anything else that I could do or would want to do,” she said. “Everyone is a teacher in some aspect whether we know it or not, and sometimes kids don’t see their potential in being a teacher and it takes us to show them that they can be.